Yes, it’s that PCem. And yes BASIC. From the post on the freebasic.net/forum. 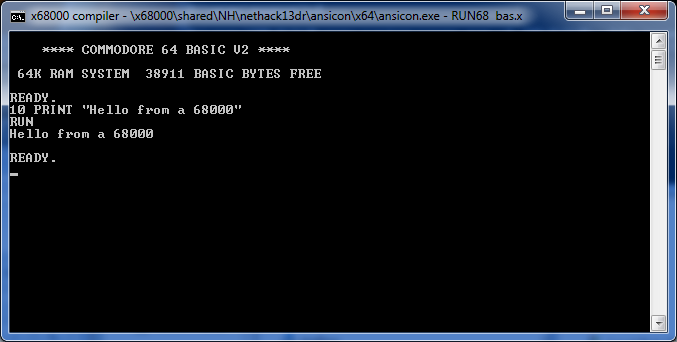 Some time ago I raised a challenge: make a PC emulator 80486 in Basic !!! 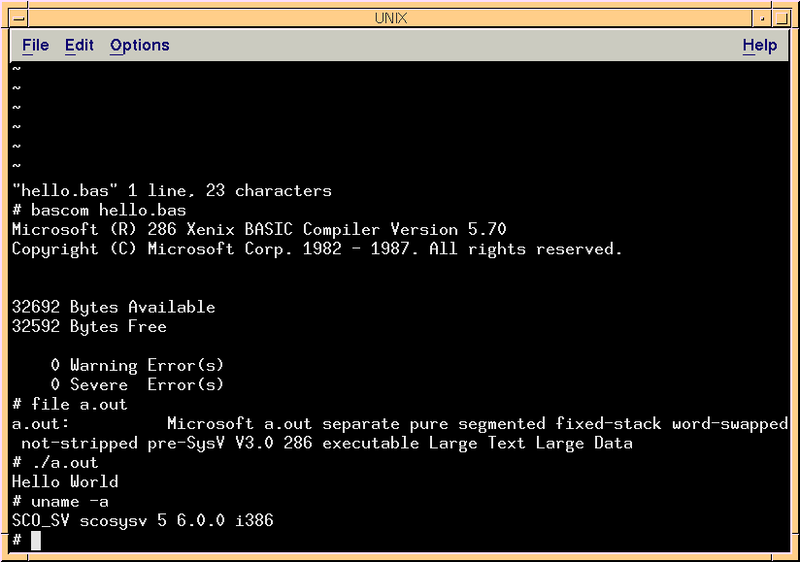 To achieve this, I used a very old version of PCEM, with the help of “FreeBasic”, starting from PCEM-V4.1, about six months ago, I managed to make it work, in 80286 mode only. Then I went little by little adding functionalities of the following versions, until arriving at the V8 (not completely, but if great part). Due to the complexity and lack of speed in BASIC, I have only converted the modules that have interested me the most, eliminating many unnecessary ones, so I have managed to reach an 80486-DX2-66mhz with FPU, 16mb of RAM and VGA TSENG of 2mb. I have removed many non-necessary modules, such as the sound (it does not have any sound), the LPT port, the PS2 port, the FDC unit and more. It has many faults, but in general they work VERY well, and it is capable of running “WINDOWS 3.11”, “Deluxe Paint”, “Wolfstein 3D” and many other programs. It can reach a resolution of 800×600 to 16 colors, but it moves better in 640×480 16 colors. The keyboard fails, all the keys do not work, and neither EMM386.EXE nor EXPANDED memory can be used, because it fails and becomes very slow. It works in both protected mode and real mode, but when entering protected mode, the PC becomes slow. It’s slow, but yes, it runs! It only has one config hard coded, as jepalza ported enough of it for this one config. Oddly enough it’s my least favorite the ‘winbios’ 486. I have to say this is pretty cool! I’m on an extended work trip, so I’ve been unable to do much of anything blog like the last few weeks. But as a bonus I have about 6 months worth of random crap from Ebay packed up to take back to Hong Kong to review. And yes, It’s nearly been a year in the making for this one, but rest assured unless the disks are un-readable this will happen!  Otherwise, the Diablo thing with the release to mobile only went over like a proverbial lead balloon. Kind of gutsy to host a convention to die hard PC fans and try to keynote on a re-skinned rip off phone app, that’s just been accepted as now ‘official’. Talk about outsourcing gone wrong. UPDATE: sad news I have a piece of luggage MIA. This may not be happening now. UPDATE2: Bag showed up, loaded the disks, and after 7% of disk one, my 5 1/4″ drive just died. 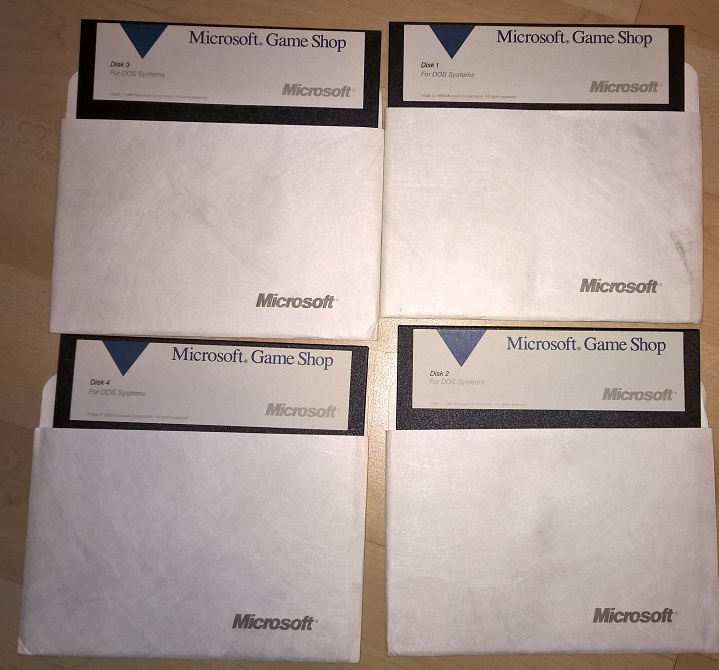 I just found this post over @pagetable.com, the source code to a bunch of old Commodore 8 bit products have been located and recovered, and place online over on github. Even better there is detailed instructions on cross assembling from a suitable PET machine for building your own KERNAL ROM. Super late, but pretty cool too! Of interest is the PET2001 Basic sources. While there have been reversed efforts dating back for years, this is the actual source code. Namely the header. RADIX 10      ;THROUGHOUT ALL BUT MATH-PAK. ORG  0    ;START OFF AT LOCATION ZERO. Which is pretty damned interesting. The infamous “WAIT6502,1” feature is also included! Back before there was sim city, the first popular simulation thing I can think of on our ancient basic bound 8 bit machines (and even mainframes running basic!) was Lemonade. Wikipedia, naturally is full of Apple citations, and of course, is absent of any mention of the most popular selling home computer of all time, as Commodore is usually scrubbed from history in favor of this narrative that Apple was some how popular (it wasn’t). 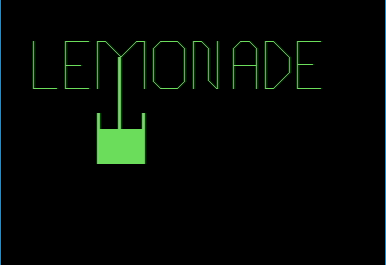 Oddly enough tracking down these older versions of Lemonade is really hard. But thankfully others have done the hard work for me! First from The Sleeping Elephant, and here is lemonade!.prg for the Pet microcomputer. It’ll run fine in Vice, although it’ll run best using a Pet 3016 – 3032 and the model 4016 and 4032. It needs more than 8kb of RAM, so the original models are out, and the ‘graphcis’ don’t display corrrectly on the larger 8000 models, although the game does run. But what about the Commodore 64? 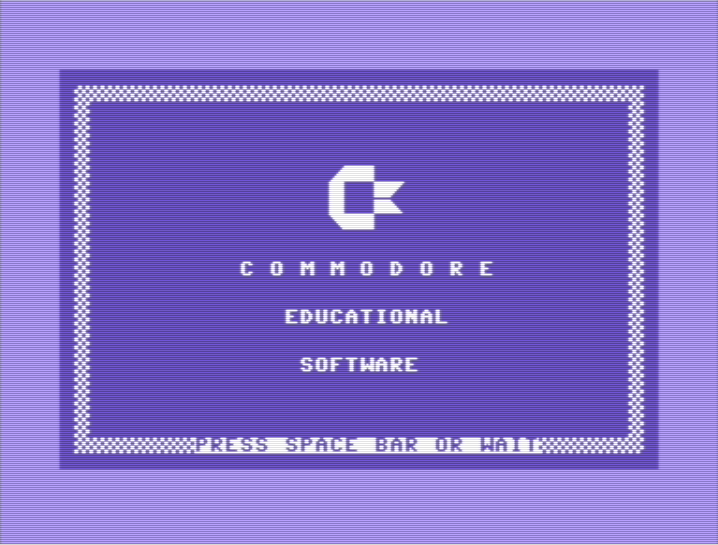 By the time the Commodore 64 came out, Commodore had stepped upped their game, and made available a large number of basic programs ported to the Commodore 64. As always the thinking is if you can convince parents that this is educational and it’ll help their kids, they’ll buy one. Well in this case they were right! Although lacking the cool animation of the PET, it does include more documentation. And thanks to vcfed.org, You can download a tape file image here. Unsurprisingly the game play is pretty much the same. 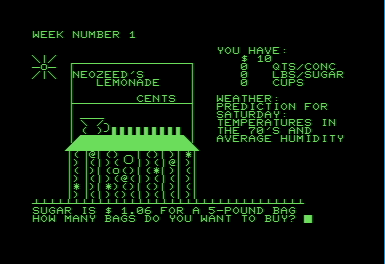 You buy your Lemon concentrate, sugar and cups, try to predict demand based on your price and the weather. You set a price, and sit back and hope for the best. Once you figured out that the first few lines (3-5 on the C64) were there to not let you alter it, you were golden. With the source, you could make summer last 10 years if you wished, or change any of the seemingly arbitrary limits. If you were really keen on it, you could also print the source code and work out the logic flow with a pencil, something that you really needed back in the days of 40 column screens. 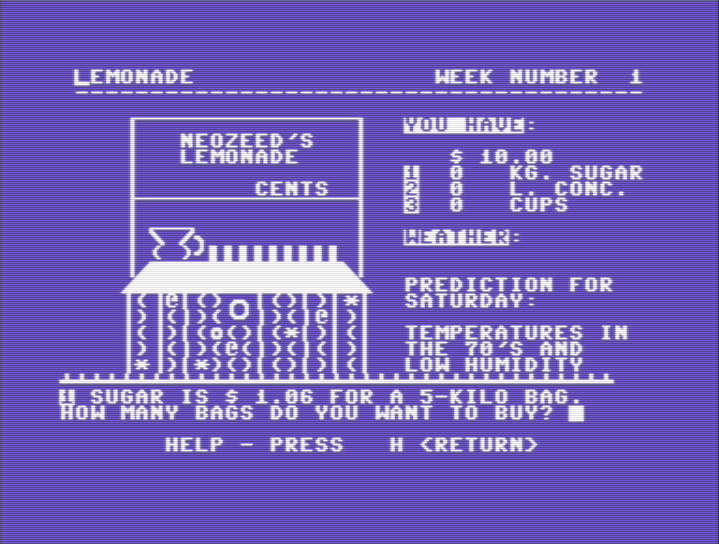 *Remember that Vice emulates the Commodore layouts, which means on the PET machines, they use a number pad. 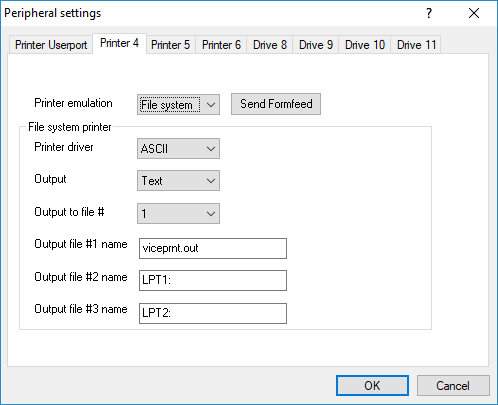 The above commands will open up the printer, print the listing output to the printer, then close the printer device. If all went well you’ll have the source dumped to viceprnt.out although PETSCII won’t render on ASCII systems, nor will the machine language portion, and a lot of the BASIC may get down shifted but you can always fix that with tr. This one came to me from Peter, a set of C++ macros and define sets that implement a subset of BASIC. YES, that is correct, BASIC. It even has line number! Let’s look at a simple hello world! “THEN” must NOT be followed by a “GOTO” nor “GOSUB”! the remaining part including the trailing newline! So it’s not 100%, there is no strings, not even a REM (conver to C++ comments) so it’ll be a while until you can build more traditional basic programs. 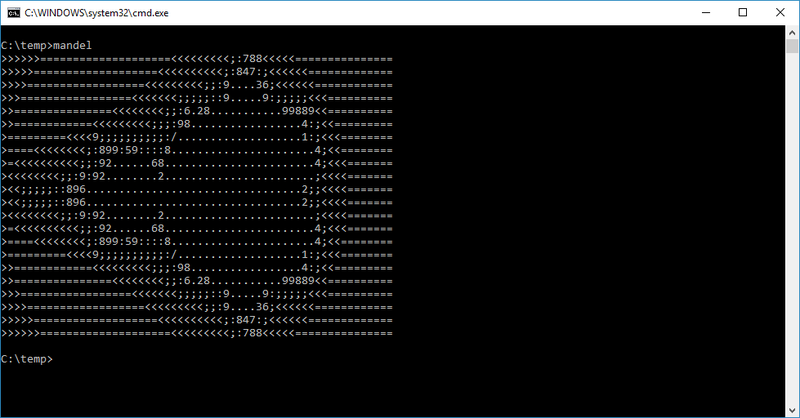 I used “mingw-i686-7.1.0-win32-dwarf-rt_v5-rev0” to test this on Windows. Usborne collection of 1980’s computer books! Back in the 1980’s home computers were a new and exciting thing, and with these machines came very technical manuals. But us young children wanted to program, and thankfully companies like Usborne filled the gap by providing programming books geared towards kids! It was a golden age as every machine had a basic interpreter. Then for some reason software companies (Microsoft/IBM) didn’t think it was a good thing anymore bundling in languages with their OS’s, or worse thinking that development tools should be a source of revenue and pricing amateurs out of the market (seriously SCO, $5000 for a C compiler?) But now thanks to the common carrier network we all have (the internet) the rise of open and free software hackers have taken things into their hands, and we are back to empowering users. So I thought it was interesting that Usborne opened up a bunch of it’s older books. All available in PDF, free for personal use. You can see their page with full details here. 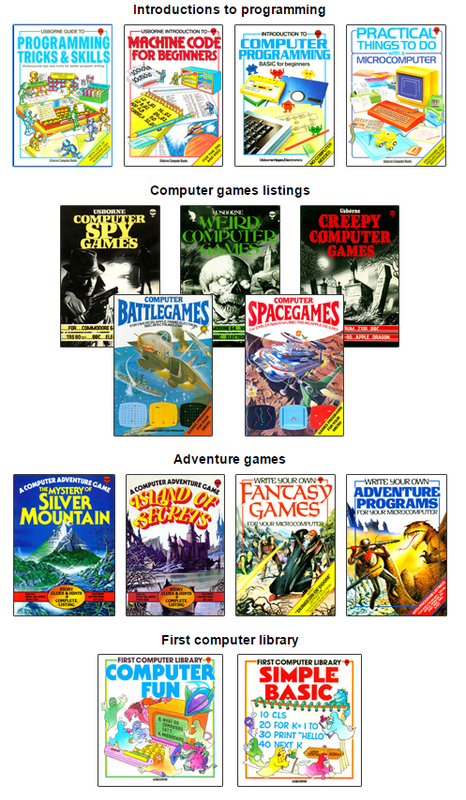 Author neozeedPosted on February 7, 2016 February 7, 2016 Categories basic, Qbasic, random updates2 Comments on Usborne collection of 1980’s computer books! 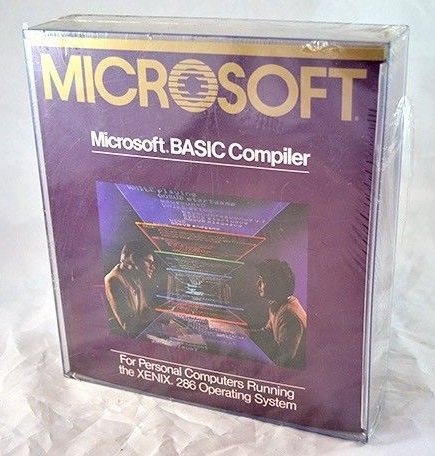 I found this repository by accident, cbmbasic which is a ‘portable’ version of the old Microsoft Basic for the Commodore 8bit computers in C which can run on any manner of machine. 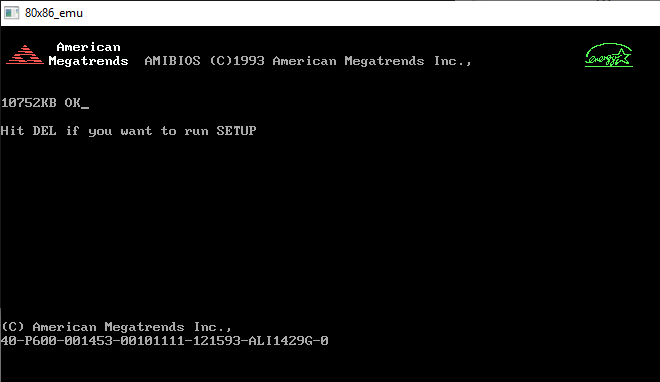 So for the heck of it, I fired up the x68000 toolchain, and in no time after gutting the file open operation as some stuff isn’t defined, and I wanted to see it run, I had a working executable. All the commands MUST BE IN UPPERCASE… Then again the Commodore did default to upper case, so I guess that isn’t a surprise. There is no ‘system’ command to take you out of basic, but Control-C works just the same. The other intersting thing, is that on the authors blog, pagetable.com, the original source code for the 6502 basic has been found. Notably this version includes portions written by Bill Gates. It is a very fascinating read. So if you are interested, TIME magazine has a fantastic article on the history of basic! 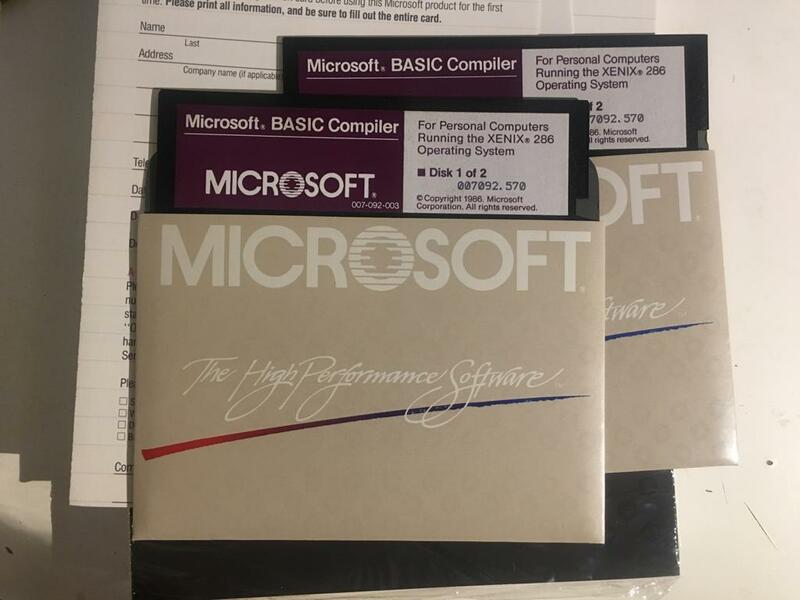 To celebrate, there is the GE simulator ‘true basic‘ on Dartmouth , and another more obscure (and seemingly deleted) simulator for MS-DOS. Which is interesting at least for more demo programs. There is even a ‘web‘ based simulator, but I haven’t tried it. 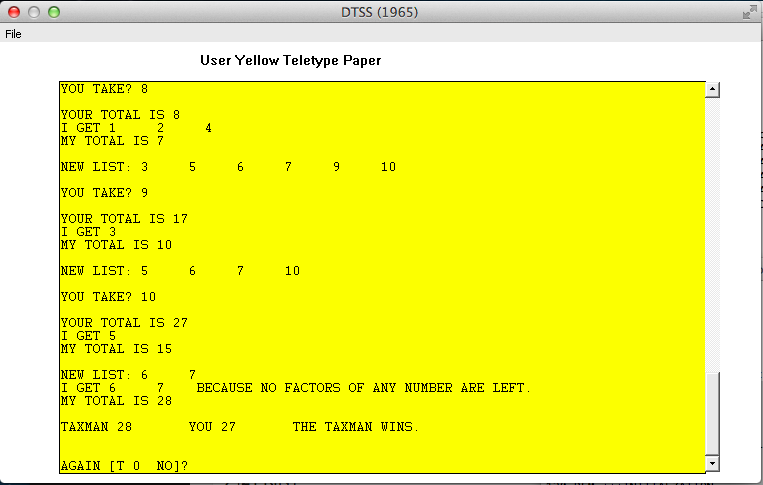 For the heck of it, I took an old ‘game’ taxman.bas (Downloaded from here, and which I extracted with SIMH) and with a couple of line changes, got it to run. It’s not much to look at, but it is kinda neat to see it run. But really, read the Time article! Author neozeedPosted on April 29, 2014 May 3, 2014 Categories basic3 Comments on 50 years of BASIC!